What Makes the Clothes Dryer Make Little Scorch Marks? A dryer that leaves burn marks on your clothing indicates several potential problems, each causing the inside of your dryer to overheat. This may be caused by the venting or the way you load your dryer. Overheating may also be a sign that some parts are worn or malfunctioning and need to be replaced. Your dryer's heat output is affected by more than just the thermostat. The dryer may be running too hot because of a clogged vent. Lint, debris or damage can restrict the vent, making your clothes feel overly hot when you take them out. The top of the dryer will also be hot to the touch, and the filter typically collects little or no lint despite several cycles of clothes going through the dryer. Use a vacuum to clear out lint and other debris from the vents and replace bent or broken lengths of pipe. 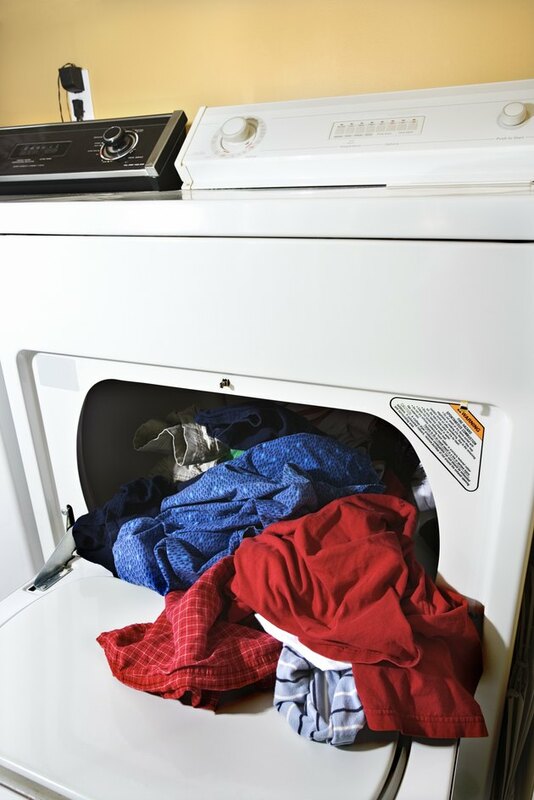 Overloading your dryer can also cause burn marks on your clothes because they can't tumble properly and certain items may be in constant contact with the heated drum. In many dryers, the drum is suspended by roller wheels with a hard rubber outer rim over a plastic inner rim. In the center of these rollers is a self-lubricating bearing. If the bearing fails, the rubber slowly wears away. When this happens, a space is created between the dryer and the drum. Your clothes can get caught and the friction leaves black marks and tears. This gap can also interfere with the dryer's thermostat, causing it to read the wrong temperature setting in the dryer. If the dryer gets hot enough, some fabrics can be scorched. When a worn roller is causing burns on your clothes, you'll often notice an unusual rumbling when the dryer runs. Obtain replacement rollers at most appliance parts stores or contact a technician to replace them for you. The front of your dryer may have nylon or plastic glides that provide support for the drum. If these wear out, the drum can drop slightly, causing your clothes to get caught in the resulting gap. Black marks that resembled burns and tears are not uncommon when the glides wear out. Replacement glides are sold as sets at appliance parts stores and both should be replaced, even if only one appears worn. Although it's uncommon for the cycling thermostat to malfunction, this may be the cause of burn marks on your clothes. The cycling thermostat cycles the heat off and on to keep the dryer at a preset temperature. When the dryer becomes too hot, the cycling thermostat opens and cuts the electrical contact to the heat source to drop the temperature. When the temperature drops, it closes again, allowing the heat element to produce more heat. If the cycling thermostat is faulty, you may have extremely high temperatures inside your dryer that can cause burns on your clothes. Why Is My Dryer Leaving Black Marks on My Clothes? What Are the Dangers of Toaster Ovens?